The mosaic of people in the European Union represents an original heritage for the ongoing construction of the European identity. For this reason, the base for such construction is far from being a homogeneous group. Do we need to remind all the discussions about identity in the countries hosting several different religious, linguistic or ethnic groups? One of the main goals of the European Union is to bridge the gaps between its countries, even though their people are still divided. What could such a European project be like? Is it about the coexistence of peoples, or rather about learning how to live together? Peaceful coexistence involves the sharing of spaces and interactions with the “others”, rather than parallel and communitarian spaces. Intercultural or multicultural? The point is to explore the possibility of a fundamental alternative for the construction of the European identity. The rest of the world looks at the European Union experience with a curious eye. How could a continent that started the major wars of the 20th century consider a project mixing such a large number of different people? South Africa, South Korea, and the USA are also concerned by such questions about the ongoing construction of their identity. Although their evolutions take place in very different contexts, similar questions characterize each of these countries experience: division or reunification? Integration or communitarism? Such different perspectives on Europe and other continents will allow having an overview of the situation. It is as a promise for discovery, a fertile ground for debates breeding a new approach to the paradoxes of our society. One Land, Many Faces wishes to encourage new encounters as well as an unexpected and creative dialogue between the different groups involved in the project. 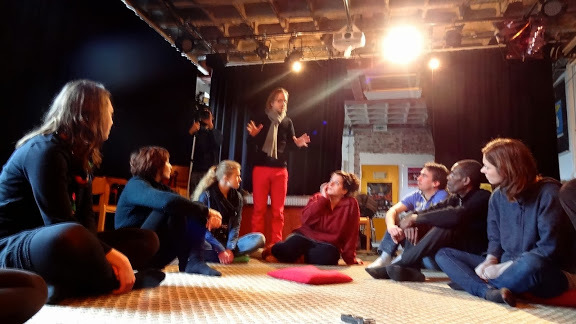 The recent experience of the different partners, in their countries and/or in other cooperation projects, showed that artistic creation are valid spaces for respiration and dialogue, while political debates often take the form of mere conflicts of positions. Over history, modern nations have often been the background of bloody fights linked to identity issues. Nowadays, in a context of relative European peace, citizens have the opportunity to question transversally their common memory and its values. They have the necessary distance, means of exchange and space of expression to draw the outline of their future identity. And this approach seems all the more essential in the context of the financial crisis spreading all over Europe and threatening the fragile balance of the Union. Furthermore, intra and extra European migration movements are currently considered at the European scale and not just at the level of the countries alone anymore. How to explore the identity issue without taking into account the people participating to the creation of tomorrow's European identity? One land, Many Faces wishes to open spaces to a dialogue and a reflection that are independent from traditional political debates: to try the experience of a dialogue between societies through art and creation. Our conception of this project is inspired by an old debate on diversity within nations and the challenges of coexistence of different communities. During the 19th century, two British thinkers underlined well the tensions of the issue. In Considerations on Representative Government, the liberal philosopher J.S. Mill explained that when a country is composed of different nationalities, people do not share the « fellow-feeling » needed to build unity in a democratic and modern state. Multiculturalism only brings despotism and the state faces only two solutions: either one nationality would be absorbed by the other or the country would have to divide. The historian Lord Acton, also liberal, replied Mill one year later saying that on the contrary, the coexistence of different nationalities under the same state could enrich a country as « liberty provokes diversity and diversity preserves liberty ». These two intellectual positions on diversity still shape today's political debates on the tensions of the « living together » or the coexistence in harmony of different communities. The theoretical debate of coexistence versus coexistence in harmony has been recently phrased in the political discourse. Angela Merkel's now famous « Multi-kulti is dead » expresses well the relevance of the issue and the need to keep the debate open, allowing for exchange among groups on this critical question. It is our goal to transform this political debate in a theme of artistic creation. Opening the Floor With the project One Land, Many Faces, we intend to offer to the question (of coexistence in harmony) an artistic perspective coming from civil society. It offers to grasp the experience of this « lived » proximity and its various realities of coexistence through the examples of different countries. The project does not aim at providing arguments for one or the other side of the debate since it recognizes the specificity of each national and international context. However, we believe that, by exchanging about national experiences, the intercultural dialogue that will emerge will lead to a renewed stimulating and creative reflection on the European identity’s development. Though divergent in their notions and realities of autonomy, Catalunya and the Basque country in Spain embody perfectly the theme of One Land, Many Faces. Both possessing separate languages, benefiting from varying levels of legislative and governmental autonomy, these two independent regions typify Spanish identity division while often also exemplifying the phenomenon of multiple identities. During 50 years, in the context of the Cold War, Germany went through the experience of division. On the 23rd of May 1949, the Federal Republic of Germany is created. Its capital is Bonn. On the other side, on the 7th of October 1949, the German democratic Republic is created. Its capital is East Berlin. During 50 years, two countries coexist, two ‘Germanies’. From one land, from one people, history has decided to make two. 1 + 1 = 2. On the 9th of November 1989, the Berlin Wall falls. On the 3rd October 1990, Germany makes the experience of reunification. Germany is reunified. 1 + 1 = 1. For Germany and for the German people, there is and there will ever be a ‘before’ and an ‘after’. Hungary, located at the centre of Europe, recognizes various official minorities. The most numerous one, and subjected to many social controversies is the Roma community. The rise of the extreme-right, precarious economical situations have fostered tensions between the non-Roma and Roma people and endangered the integration of the latter in the national society. This situation is similar in other countries in Europe. Taking regional differences in consideration, One Land, Many Faces aims at provoking a transnational dialogue on the integration of Roma people at the European level. In 1884, the national motto is chosen: L’union fait la force, Eendracht maakt macht, unity is strength. Yet, Belgium remains a complex mosaic, dominated by the main division between the Dutch-speaking community of Flanders and the French-speaking community of Wallonia. One land for different peoples. Was the motto of 1884 a mere game of history? Was it, beyond the richness of diversity, a hidden aspiration, a utopia, an illusion? Going through the Belgian history and experience, the project will ask these challenging questions, participating then to the dialogue between the different communities. The situation of the Balkans also interests us. Wrought with a history as painful as complicated, the Balkan countries, now 7 independent nations were birthed from conflict and violence less than a generation ago. Our choice of the former Yugoslavia is evident, the lines and frontiers separating Croat from Serb from Macedonian being more geopolitical than cultural or linguistic. The repartition of Yugoslavia, the remnants of Yugonostalgia as many Balkan intellectuals call it, hits full on the challenges of reconciliation, of co-habitation, of moving forward together past division. French relation with its own identity is mainly built on its revolutionary period and on its determination to become and remain a unified laic republic defending the Universal declaration of Human Rights. Such politics have brought to the refuse of local particularisms and transformed society through the official language and the public education system. On the other hand, France led a bloody colonial policy in strong contrast with the humanistic principles it pretended to support.